Most of the increase in the price of fuel by the government will be taken up by an increase in the levies government will collect for every liter of fuel sold. These levies have been increased by 358% in the case of diesel and 299% in the case of petrol. Where the government used to levy 46 cents per litre, it’s now levying $2.11 per litre for diesel. 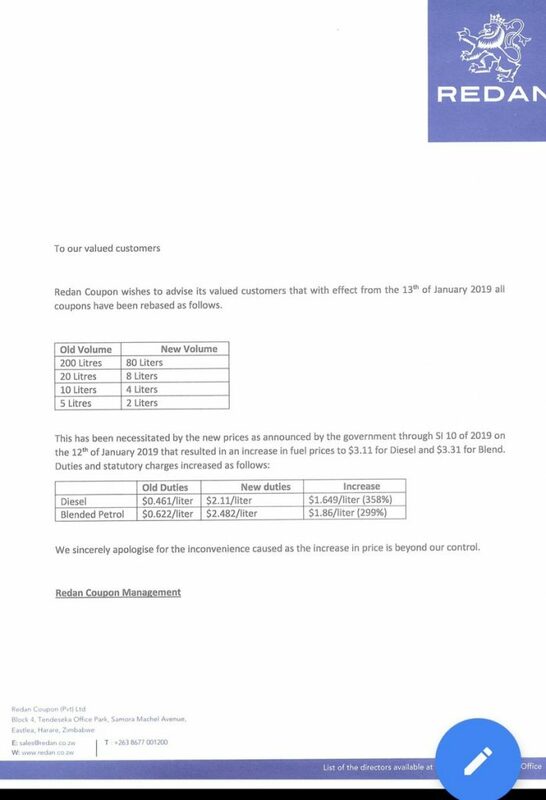 A notice to customers issued by Redan Coupon Pvt Ltd has revealed that fuel duties have been increased. We sincerely apologise for the inconvenience caused as the Increase in price is beyond our control. First sensible thing Mnangagwa has done – get the idiots off the roads. You are the idiot mate. Fuel increase in price for whatever reason woll alwsys have a knock on effect on all the sectors of the economy.